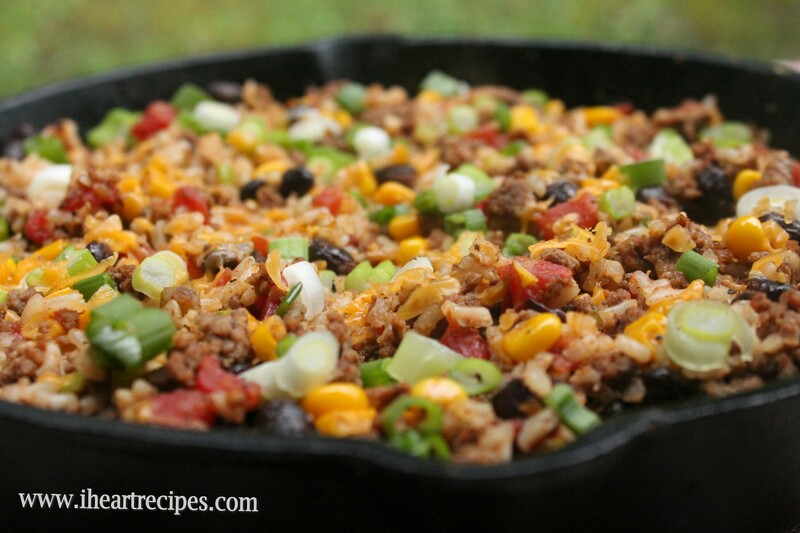 A quick and easy Tex Mex Ground Beef Skillet dinner made in under 30 minutes! Hey y’all! As requested I have a quick and easy dinner recipe for you. 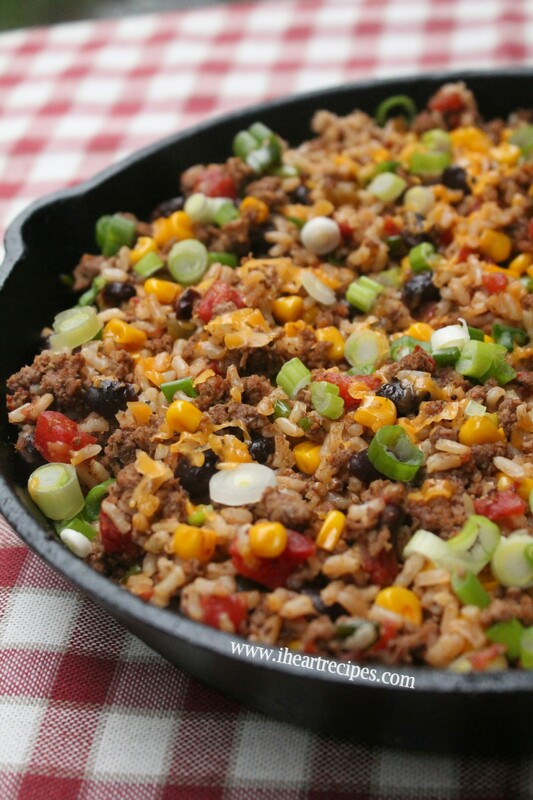 I’m going to show you how to make a easy and delicious tex mex ground beef skillet! This dish is perfect if you’re pushing for time, and want something made within 30 minutes. Not only is this meal easy on your time, but it’s easy on your pockets as well. 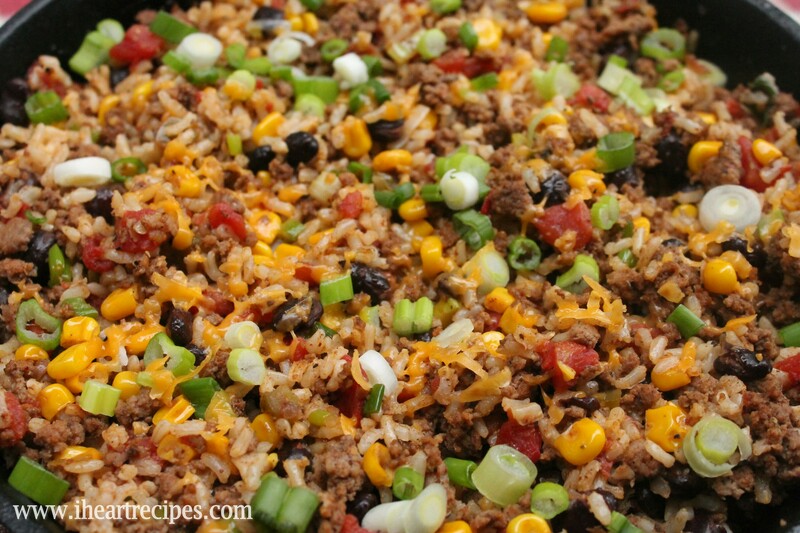 I use super affordable ingredients such as ground beef, rice, corn, and beans. Most of the ingredients used, if not all, you probably already have on hand! The ground beef that I used was regular ground beef. You can use lean if you choose. If you decide to use regular ground beef like I did, be sure to drain all of the fat once the meat if browned. If you’re not a fan of beef, feel free to replace it with ground turkey. I used a can of low sodium Rotel for this recipe. You can use a generic brand, or regular canned tomatoes if you’d like. Just make sure that you drain the liquid from the can before adding the tomatoes into the dish. 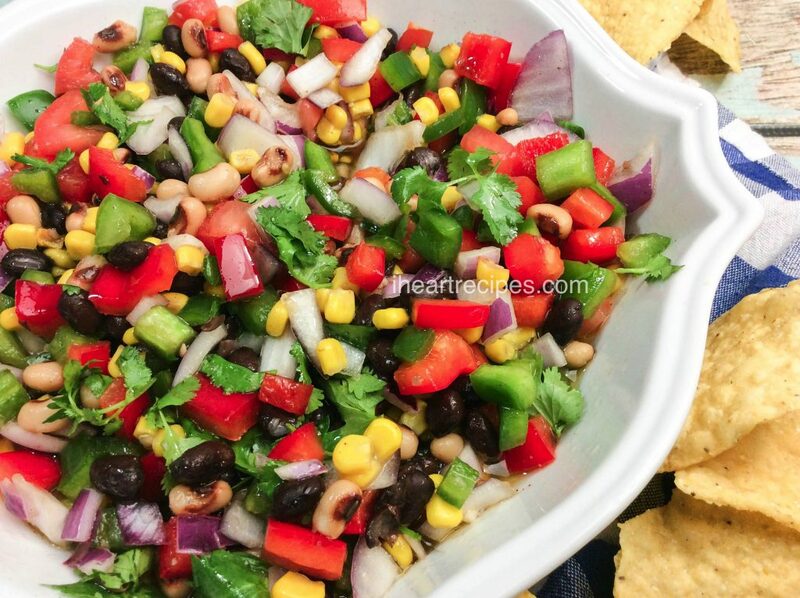 I used canned black beans for this recipe. Before adding the beans into the skillet, I made sure to drain the liquid from the can, and I also rinse the beans under cool water. If you’re not a fan of black beans you can use red beans, or pinto beans. You can also leave the beans out altogether if you’d like. This is a perfect weeknight dinner dish for when you're pressed for time but want something filling and hearty. 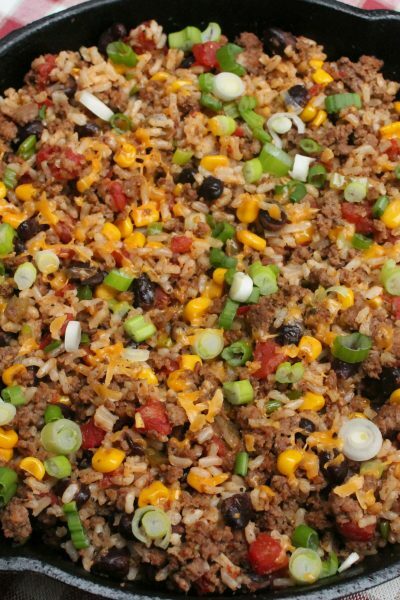 This recipe is like a taco in every spoonful with the meat, beans, rice and veggies all blending together. Sprinkle in all of the seasonings, and stir. 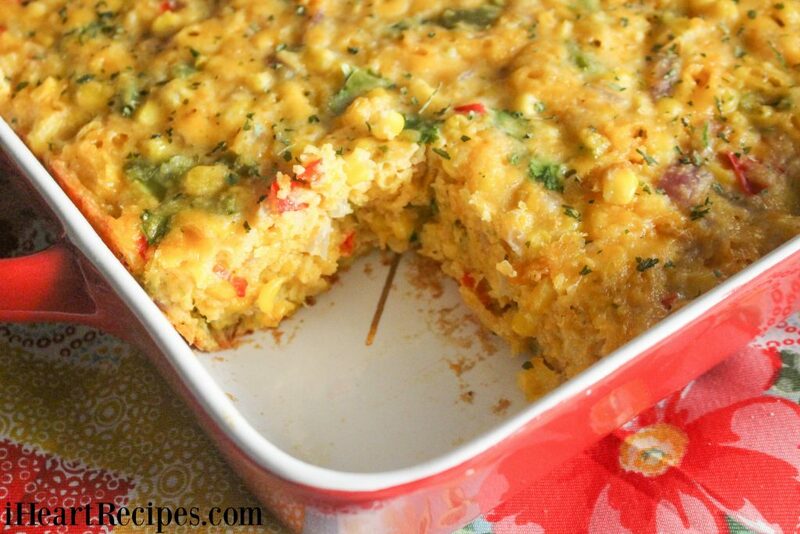 Add in the corn, rotel, and green onion, then mix the ingredients. Cook for five minutes then add in the rice, and fold in all of the ingredients. Next, add in the beans, and stir the ingredients until well combined. Cook for 5 minutes or so, then turn off the heat, and top with cheese and green onions. This looks so good! Love how quick and easy it is to get on the table. Pinned. Thanks for sharing. I am definitely making this. It looks delicious! Tried it!! Was delicious!! And very different for a change, thks Rosie. I’m looking forward to making this but I have a question. You give your taco seasoning recipe but don’t specify how much to use. Do I use the whole mix for the 1 1/2 lbs beef? I did give the specific amount. I used all of it hun. I really appreciate all the work you put into your website. I like how you not only have the recipe, but a video showing how to as well. I’ve cooked with you many times! Thanks!!!! Needed something quick and this hit the spot. Thanks so much for your great and short video. 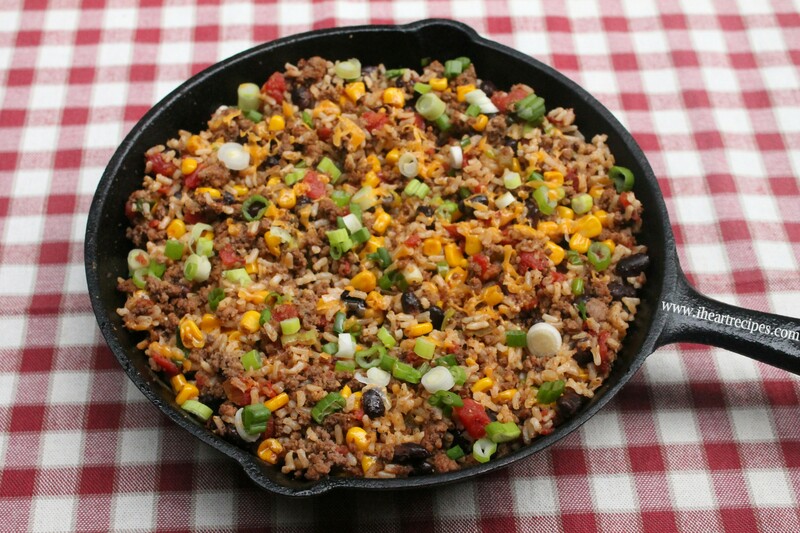 I was craving some kind of ground beef, rice, and veggie skillet tonight, but I hadn’t thought of Tex-Mex seasoning until I found this recipe. It hit the spot! My 6-year-old called it the best supper ever, and he rarely says anything like that. Thanks a lot! I’ll be making it agian. Hi Kate! Glad that you liked the recipe! This recipe made a great lazy friday meal. My wife and I ate it with multi grain tostitos scoops and we absolutely loved the meal, thanks Rosie! Yes! I love to serve it with tortillas, guacamole, and sour cream! Yummy! Thanks for trying my recipe! I am so glad I found this! I was looking for a ground beef recipe that WASN’T meatloaf, stroganoff, meatballs or tacos! I had everything I needed in the cupboard and best of all, my picky eater loved it. She also saw some of your great looking desserts, so we’ll have to try some more of your recipes. Thank you! Thanks for trying my recipe Val! I cant wait to try it! Question… The recipe says “low sodium taco seasoning” and then it has some seasonings listed below it. Are those the ingredients of the taco season, or are they in addition to your taco seasoning mix? I stumbled upon this and made my own rendition, but what a great base you built for me! Thanks! As delicious as this was the first night, it was even better the next night! We really enjoyed it and I’m making it again tonight! Hi Rosie, I made this recipe for me and my boyfriend and we both love it! You and your recipes are awesome keep cooking! Made Rex Mex Skillet last night for dinner. My kids and I absolutely loved it! Looking forward to trying more of your recipes. I give my own 5 , 5th star won’t light up. I made this tonight! It was absolutely delicious! My picky 7 year old son enjoyed it as well. The only ingredient I didn’t have was tomatoes/rotel. I can’t wait to make this again and include it. Made this a number of times now and the recipe is perfect as is – a rare find these days. Excellent job! Thank you! This is becoming a staple recipe for our family. Should the rice already be cooked before putting it in? 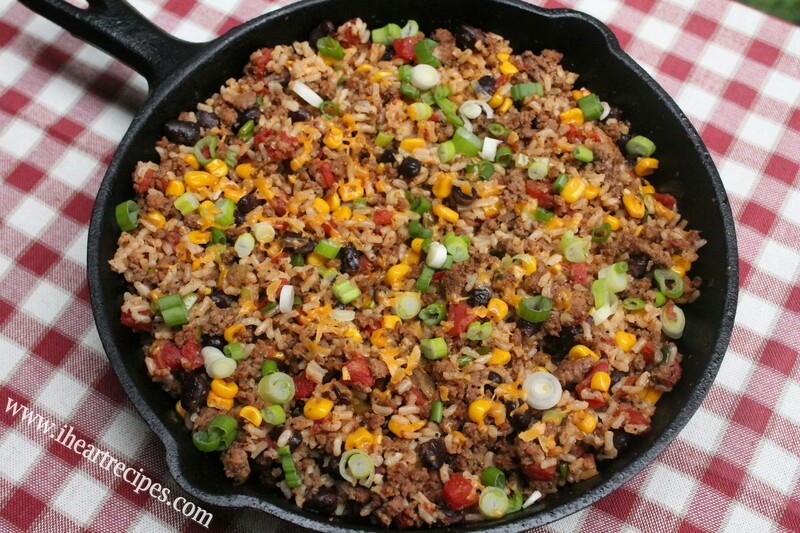 I made this with ground venison and it was amazing! Thank you so much! I made this for my boyfriend of two years, the next day he proposed!!! We’ve made this fabulous dish twice. The first time we used ground turkey and the other time using chopped chicken breast. Both were delicious! We also made cilantro lime rice to accompany the dish and it was right on time. Thanks for another awesome recipe Rosie! This recipe turned out great! I also added sautéed green pepper and onion, and diced,fried potatoes. When it was done I topped it with the shredded cheese and I also added a few avocado slices on top. The whole family loved this meal! This is a great recipe that you can customize, it would also be great with pan seared chicken strips instead of ground beef! This recipe was very tasty yet simple to make. This was really good, fast, and made a lot of food. I made one where i followed your recipe and beside it one where i did everything the same except used chicken and store bought fajita seasoning which was very flavorful and delecious. Made this last night and it was delish! Hubby even loved it. Love making new recipes. Thanks for a yummy recipe Rosie. Can I use one package of taco seasoning? Like the store bought one? If you choose to, but that will change the recipe.